BANGI, 22 Nov 2012 – Researchers working at The National University of Malaysia (UKM) are close to coming up with a mulching mixture that can help reduce soil erosion on slopes where buildings are constructed. The head of the research team, Dato’ Ir Ahmad Fuad Embi said the team expects to finalise the formula for the mixture which is economical to produce locally and may be even better than imported mixtures which many developers are now using in Malaysia. The mulching mixture which will have local ingredients of nutrients, fibre, glueing agents and plant seeds is being tested at UKM, he said when presenting his team’s findings at the two-day Seminar and Workshop of a Sustainable Campus 2020 here today. His research paper Erosion and Sediment Control in UKM Campus also proposed that a combination of measures be adopted to reduce landslides and slope erosions caused by heavy downpours. 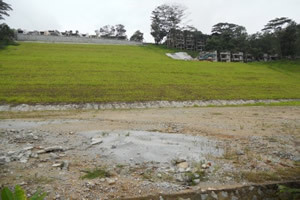 The mulching product could be sprayed on to eroding slopes to protect them from intense rainfalls which are common in Malaysia. Ahmad Fuad said the mulching product is similar to imported ones, which are quite costly and contain seeds not suited to tropical climate. It should last more than a few months on the ground, enabling the seeds to germinate and fully cover and protect the soil with greenery by then. If successful, the local mulching product can be produced on a larger scale at very low cost and distributed or sold to local authorities and institutions. He believes this will effectively solve the ongoing problem of erosion and sedimentation, especially as the country is experiencing more landslides in recent years. The former Deputy Director-General of the Department of Irrigation and Drainage, however, said adding mulching products alone are not enough to minimise risk of landslides. 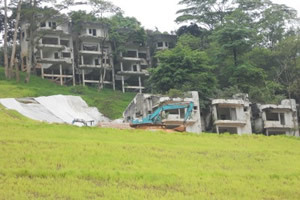 Local authorities must strictly enforce the building code of construction on hilly areas, such as found at the UKM campus here. Guidelines from the Public Works Department (JKR) should be made into concise regulations to be strictly adhered to by contractors. At present the guidelines are not enforced because they are not mandatory. i. The building should be designed to fit the contours of the hill and not the other way around. because the natural shape of the hill has been changed. first before the green light is given for ground-breaking. contractor for any particular project. He said design of the building must fit the landscape rather than changing the natural land to suit the building. This will minimise earthwork, thereby causing less disturbance to the soil. Ahmad Fuad is concerned when delays and obstructions occur after a BQ is given to a contractor, which would then jeopardise the quality of the service. The relevant authorities should review the BQ from time to time to ensure consistency. He called on the Works Ministry to make it mandatory for all contractors and landscape engineers to attend the relevant courses, which are only optional at present. Ahmad Fuad holds a Bachelor’s Degree in Civil Engineering from the University of Canterbury and a Master of Science (Irrigation) from the University of Southampton. 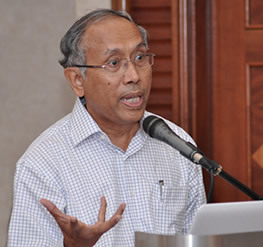 He has over 36 years of work experience in civil engineering and is a registered Professional with the Board of Engineers Malaysia He retired as Deputy Director-General I of the Department of Irrigation and Drainage in 2007. He is also doing consultancy work for large-scale public works carried out by the private sector.